Mature believers must recognize the dual message in Christ’s parable of the prodigal son. In many ways it could be considered the parable of the prodigal sons. One son refused to stay in the home due to sinful rebellion. One son refused to enter the home due to sinful unforgiveness. One son squandered his father’s wealth. One son coveted his father’s wealth. One son was humiliated by his own scandalous behavior. One son was humiliated by his father’s scandalous grace. Beginning our faith journey, we struggle to understand how God could love us and adopt us into his family despite our sinfulness. But after living comfortably as a member of God’s family, we soon struggle to understand how God could adopt anyone else. There are limits to what is restored to the son who returns. His inheritance is spent and will not be restored. He will be financially dependant on his older brother. But in every other aspect, he is restored. He is restored to full fellowship, full honor, and full trust. These things are indicated by the sandals, robe, and ring. His identity is restored. His authority is restored. He is not a second-class family member. Pray this prayer for an older brother this weekend. God the Father will come out to you, and beg you to rejoice at the scandalous sinners he has adopted as his children. God, your mercy is a mystery to me. I see the sins of others and I am scandalized. How could such a one be accepted? How could such a one be loved? How could such a one be forgiven? How could such a one be trusted? You come out and embrace me, Father. Over your shoulder I see the celebration. The day you celebrated me, repentant. The day you celebrated me, returned. The day you lifted me up when I was humbled. The day you purified me from my scandalous sin. The party is not for my prodigal sibling but for me. 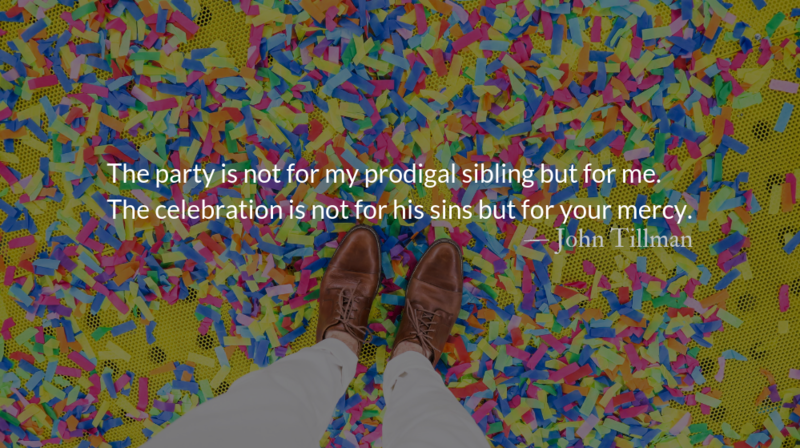 The celebration is not for his sins but for your mercy. Put your arm around my shoulder, Father. Lead me in, to celebrate mercy shared. Lead me in, to rejoice for sinners changed. In a very real sense, not one of us is qualified, but it seems that God continually chooses the most unqualified to do his work, to bear his glory.